A Real Toxic Mag Live! This AES replacement for FreeMiNT brings some new features: window resizing by grabbing the borders or the corners of a window, shutdown procedure more stable, better task manager, etc. According to its authors, this version is 33% faster than the previous one. The hard disk and floppy disk management has been greatly enhanced. The sources and the binaries for Linux and Windows are available on the emulator page located on SourceForge. A new library for LDG is born. Written in C by Philippe Castella, it will help the developpers who wish to use XML documents in their own productions. Another update (it's a proof that Atari users are still alive): the fabulous Easy_Gem library and PcStudion a shell for Puce C, are now compatible with MagiC 6.20. The world famous German demo crew has released two 512-byte intros (coded by Ray). A new member called Remo has just joined tSCc. Well-known on Commodore 64, the crew called Creators has opened an Atari section. Two new member joined the crew: Blind Io (coder) and Exocet (graphist). According to the information on their Web site, they're prepairing an Atari demo. Two games for Atari ST have just been resurrected. The first one is Cyberdrome, it comes back with the version 1.2 (shareware). This 3D action game works on every Atari with 1 MB of RAM. Last but surely not least, it can be networked for multiplayer games. The second game, called Artic Moves, was never released before, although it was ready in 1995. It is available as a freeware now. The development of HighWire still goes on: more stability, better table display... Moreover, the documentation is also available in French. Manufactured by Casio, this strange Atari watch was presented at the CES 2002 in Las Vegas. According to the rumours, it should be possible to take photographs and to play to old Atari games (probably under Infogrames licence) with it. 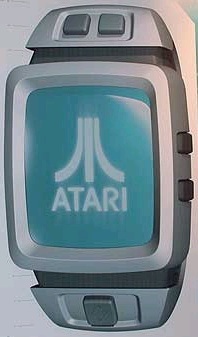 STFA means "Sound Treiber Für Atari" (sound driver for Atari). This universal driver is developped by The Removers team. It makes the sound programming easier for every Atari and the clones. The programmer guide is available in English. Patrice Mandin has just ported the SDL library (Simple DirectMedia Layer) on Atari. This is a free cross-platform multi-media development API (see the SDL site) for games, demos, emulators... The first Atari application using the SDL is Nuq, a Quake clone. The version 0.3 is available, but you will need a powerful processor to play at a decent speed. On March 2nd and 3rd, the 5th "Salon Régional de l'Informatique et du Multimédia" (multimedia and computer meeting) will take place in Villeneuve d'Ascq (extreme north of France, near Belgium). This meeting will be opened to all the platforms and OSes. Cybèle Maïa (a French Calamus reseller) will be present and will make demonstrations of Calamus SL2002. The source code of DGem is now available (GFA Basic), as well as the level editor. creation of new software for TOS compatible computers. This organization will be financed by contributions, collected money will be used to buy the source codes of abandoned software and to help new developments. This beta version of a Dungeon Master clone only allows the player to walk in the labyrinth. The sources will be available soon (GFA Basic). the 640x400 mode and beyond. The version 3.30 of this GameBoy emulator for ST, TT and Falcon is available now. The very first issue of this Falcon diskmag in English is available. It only works with 14 MB of memory (or with some FastRAM). We're still and always speaking about magazines with the 3rd issue of AtTOS, a new fanzine in French. The main editor is also that of the famous fanzine Revival, the 100% alternative video games magazine. In AtTOS, you will find: news, articles on Calamus, an interview with Rodolphe Czuba (the creator of future CenTurbo 060), etc. Each issue costs 3 euros and it is possible to subscribe. The site dedicated to this new Web browser has just been updated. You can download the sources and the binaries for the last version. HighWire needs a multitask operating system with NVDI (or SpeedoGDOS). Organizer is a tool for plannings and meetings. It's only available in French (for the moment). It needs a multitask OS, more than 2 MB of memory and a ST-High screen resolution (or more). The Polish crew Satantronic has released two intros: X-Mas 2001, for Christmas (it runs on ST/STe/Falcon with at least 1 MB of memory), and Planar (for every ST/STe/Falcon). In this issue, you will know everything about the Falcon recasing and about SCSI & IDE programming. You will find some software tests too: PhotoTip 3.10, AtarIRC and AtarICQ. MyMail 1.53 is available. This e-mail client works with STik, STing and Mintnet.